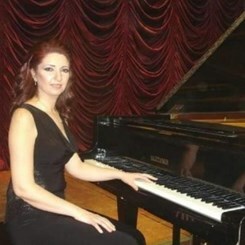 I am a pianist, piano teacher, composer, and choir leader. I began learning to play piano at the age of eight; my achievements allowed me to receive honors certificates from professional pianists as well as a bachelor’s degree in classical piano studies when I continued my piano education into higher learning. Because of this, I am highly experienced in teaching classical piano music such as: sonatas, Bach inventions, preludes, and fugues. As a teacher, I instruct my students by emphasizing certain aspects of teaching such as: performance, technique, posture, reading, and understanding the elements of any song. My method is to make students feel comfortable and excited about learning, giving them an amusing and enriching environment, and ultimately making the students want to return for more lessons. I believe that if students feel like class is fun, they gain a confident personality and further enjoy learning to play. Having performed in solo concerts as well as concerts in which I was accompanied by violin and cello, I feel that performance can immensely build up a student’s musical expression. This applies to all my students no matter if they are beginners, intermediate, or advanced in their studies. I believe that learning and teaching are critical pursuits with which people interact. Research shows music develops any young mind, supports the brain in emotional, academic, spiritual, and physical activities. A music teacher should be motivated to aid every student to learn not only music, but creativity, intellectual skills, and more. Music is important for the development of any kids’ minds. Request Lessons with Elise today!